It's been ONE YEAR since the very first Collage Friday link up! I had no idea when it started the community it would become, the friends I would make, and the ideas we would all share each week. Collage Friday has also held me accountable. I know I must recap our week each Thursday night to share with all of you. I love looking back on what we have accomplished, the struggles we have faced, and how my children have grown! Yes, just six blogs linked that first week. Now, the average is around 30! Take a minute to visit some of these bloggers. They are moms who pour their heart and soul into home education and I have learned so much from each of them. I'd love for Collage Friday grow even more over the next year. Grab a button from my sidebar, link up and spread the word! We are finally decorated for the holidays, and had a productive week of school. I'm not exactly sure where the week went, but it's Friday already! 1. Anna has been asking about learning to play the guitar (which would require us getting a guitar!). She's asked for one for Christmas and we went to the music store this week and looked at them. It seems like the next natural thing since she takes piano lessons and sings in a children's chorus. 2. Grant got this book - Angry Birds Playground (Around the World Habitat Adventure) by National Geographic. He read the entire book in one day! It's great! If you have an Angry Birds lover, you might want to put this on their Christmas list. 3. We have been working on my Nutcracker Unit Study. One of the things I printed for Anna was Trepak to learn on the piano. 5. Anna has started reading The Hiding Place. She's enthralled with this book... I had been saving it for her until I felt she was old enough to handle the subject matter. 1. More Nutcracker! While watching the ballet, Anna made this adorable pom-poms (thank you, Pinterest) for Christmas packages, and Grant built Nutcracker LEGO creations! 2. We listened to The Nutcracker constantly this week. As the kids were humming it in their rooms yesterday I hollared to them "Ha! It worked!".... they replied, "What?" I told them I had succeeded in stuffing the music into their heads and now they were humming it -- musical brainwashing of sorts! 3. Not really from our homeschool, but from Sunday School. My husband and I teach the 4th-6th grade class and our lesson this week was about Jeremiah and the potter. It was such a great lesson and we made mosaics. 4. At a Christmas party for my husband's office last weekend Anna made several new little friends. She's very good with small children and now adults look to her for assistance! 5. Each morning this week I would read a different book out of our Christmas book basket. I think The Grinch is the kids' favorite. We've also been reading Bartholomew's Passage each evening. This weekend is going to be full of fun things! We have out of town company coming to stay with us. Anna's Spivey Hall concert is Friday night (tonight! ), and the rest of the weekend is full of fun things, too. Next week we celebrate Grant's 8th birthday. This is always a busy time for us, but full of so much fun. I'd love for you to link with me. Please grab a Collage Friday button (in my sidebar), or text link back to this post. Sign the linky and then visit other bloggers on the list. 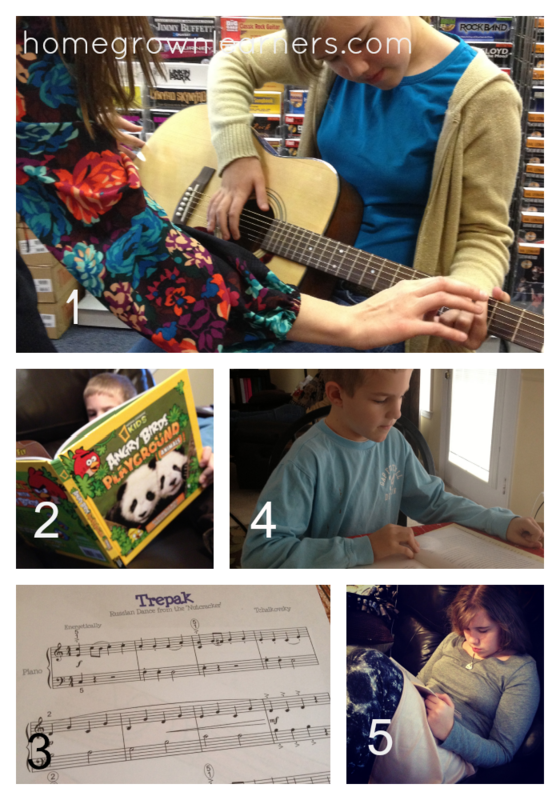 Of course, make sure your post contains photo collages to document your homeschool week.